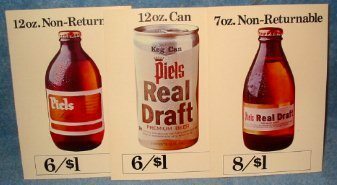 Piels Real Draft point of sale signs; Lot of 3 different 7 1/4 x 5 inches, glossy, photo like cardboard signs. A little different for POS signs. Vintage unknown. I’m guessing 80’s. Unused, great shape.